Chris Larson 2016 ... "Another first for me. This sp comes from up near Puerto Vallarta in Mexico. I’ve had it a couple of times and not been able to stabilize it. Seems like it is going well now." I got this till from Rainforestflora. I have tried to find photo to compare with. 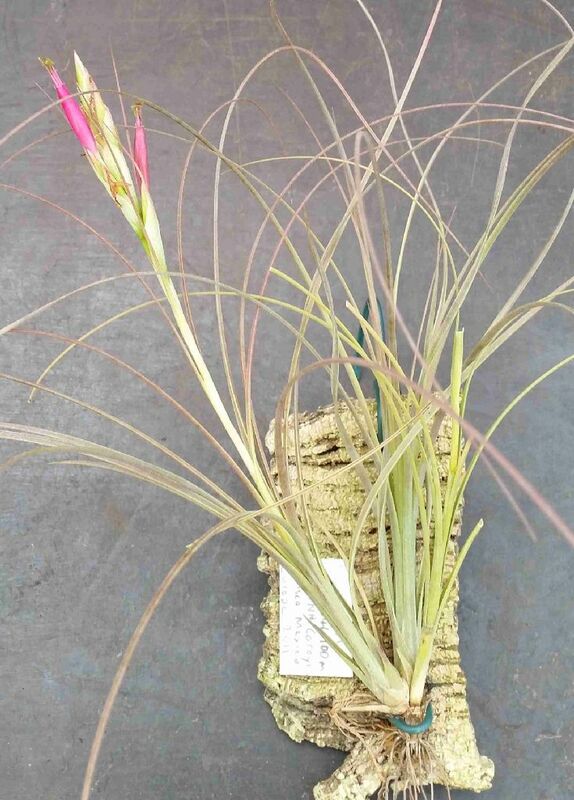 My plant looks the same as T. eisteteri in Bromeliads in Australia site. I think it is correct but it looks strange because the petals are lilac. It is too hot here at the moment which made it bloom when too young. I have another biger one but it is not blooming. Derek Butcher ... "Loma. From your photo I would say the petals are lilac not the red it should be. What colour do you see?" Kosit Kaewkangwal ... "Dear UD. Yes the petals are lilac, I will take another photo next time it flowers." Derek Butcher ... "Discussion group - I am not sure how common this is in OZ but seek your comments. Is it that variable or is the photo a hybrid as I suspect?" Chris Larson ... "Mine, from the original location, is definitely red flowered." Renate Ehlers, from original description. 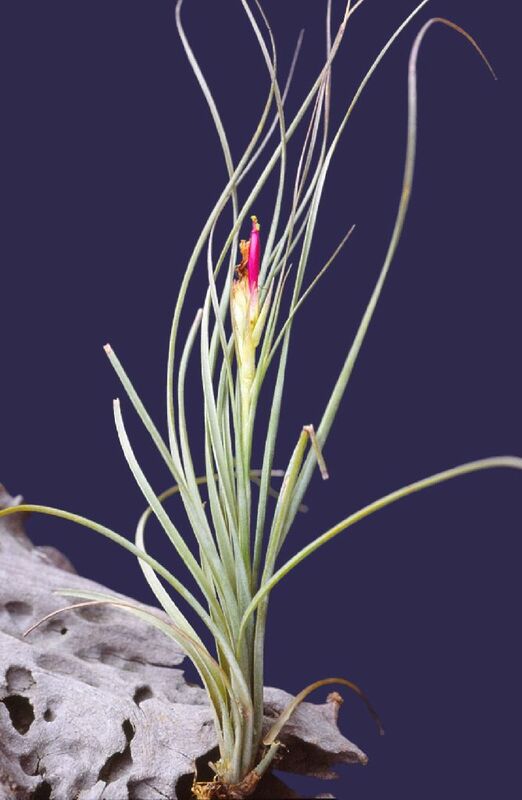 A Tillandsia setacea SWARTZ vaginis et laminis foliorum latioribus, laminis planis, non setiformibus, inflorescentia densiora rhachide breviora non geniculata, spicis minus applanatis, bracteis florigeris longioribus, sepalis longioribus, liberis et petalis rubris longioribusque differt; a Tillandsia pseudosetacea R. EHLERS et RAUH in RAUH vaginis foliorum longioribus latioribusque, laminis foliorum latioribus et planioribus, inflorescentia folia superante spicis magis composita, bracteis primariis multo lon-gioribus sepalis glabris et liberis et staminibus petala superantibus recedit. Typus: Mexico, Estado Jalisco, prope Tomatlan (in via 200 Puerto Vallarta - Manzanillo), Marti 1990. leg. R. & K. Ehlers EM 901504 (holotypus WU, isotypus WU); Estado Jalisco, Chamela, prope "Estation biologica de la Universidad de Mexico", 15.3.1990. leg. 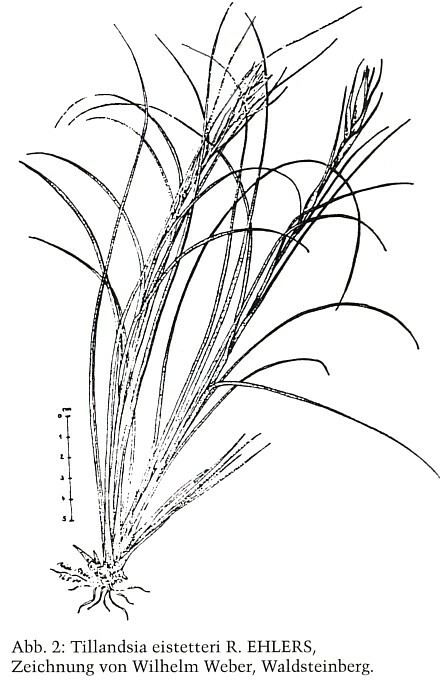 R. & K. Ehlers 901501 (paratypus: WU); Estado Colima, epiphytica prope Manzanillo, martio 1981, leg. R. & K. Ehlers EM 811025 (paratypus: WU); Estado Jalisco, in via 200 Barra de Navidad - Puerto Vallarta, prope Cuitzmala, martio 1990, leg. G. Noller s. n. (paratypus: WU ). Plant - Stemless, dense bushy, making an erect rosette flowering to 30 cm high. 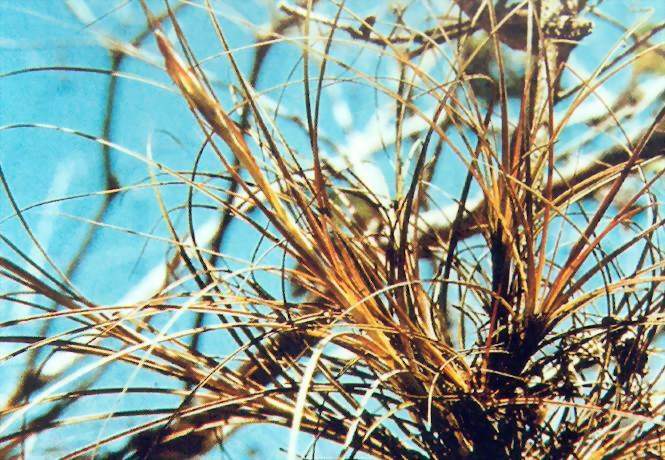 Inflorescence exceeds the leaves, growing into a dense multi-headed grass like thicket. 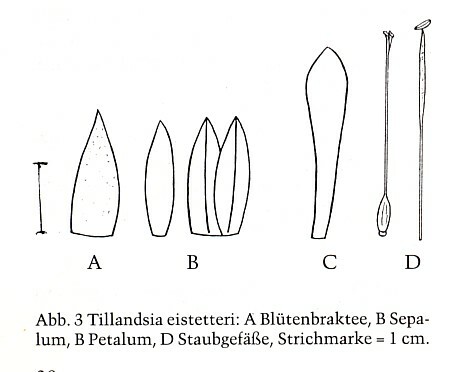 Leaf Sheath - to 3 cm long, 1.9mm wide, three angled, almost clearly distinguished from blade, brown, inside dense brown, outside fine gray scaled. Leaf Blade - above the sheath 5mm wide, erect, 7-10cm long 3-4mm wide and narrowly triangular in one long filiform, bent towards the outside, tapering to a tip, the edges bent inwards, green, near stronger sunlight red, both sides with fine grey appressed scales. Scape - erect, 10-15cm long, 3mm round, densely imbricate and densely covered by the sheath of the leaf like scape bracts, internodes 2.5cm (as long as the sheath), the blade long acuminate filiform erect, the upper shortly tipped. 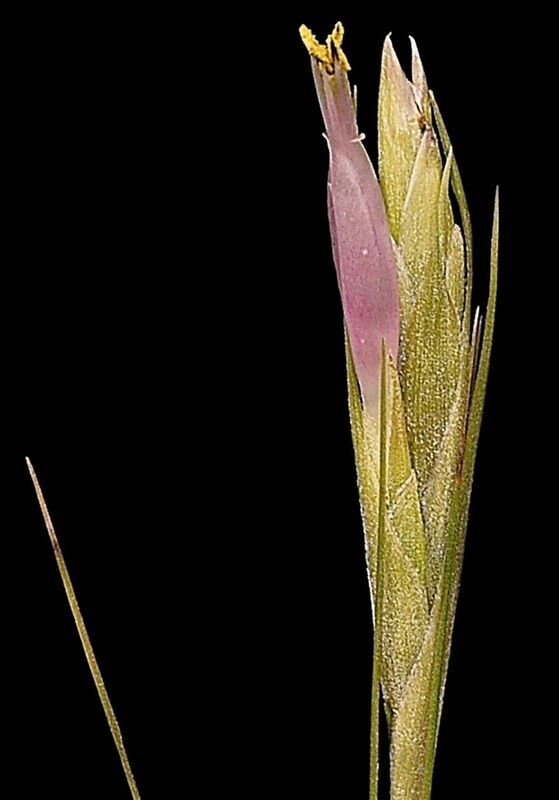 Inflorescence - Mostly bipinnate with 2 to 5 dense erect, upright, compound spikes, to 5.5cm long, 2cm wide, abundant, however reducing to simple, with dense polystichous flowering spike. 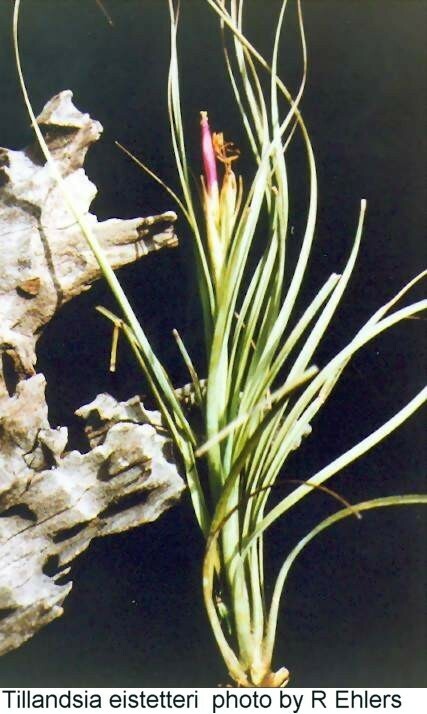 Primary bract - sheath as long as the bottom spike, covering the broad side of the spike, with filiform acuminate tip, hooked tip widely overhanging the top spike, gradually shorter. Spike - 1.5 to 3.5cm long, thin elliptic, not strongly complanate, partly roundish, 1-3 flowered compound, sometimes an extra sterile bract at the base, erect. Neither the spike rhachis nor the inflorescence rhachis are left visible. Flower Bract - erect, densely imbricate, 1.4 to 2cm long, 7mm wide, oval acuminate, leathery, red or green, the tip particularly is scaled. Sepal - to 1.5cm long, 3-4mm wide, lance like, acuminate, green naked, the posterior ones keeled, free. Petal - 3 to 3.5cm long, the upper portion 6mm wide, narrowing to 3mm at the base, tongue shaped with a bent recess, making an erect tube with tips bent a little towards the outside, red becoming white at the base. Stamens - overhang the flower by 8mm, filaments 3 to 3.3cm long, arranged in two unequal long rows, the top part 1mm dia. oval, red (similar colour to petal) towards the bottom ribbon like narrow and becoming white. Anther - 2.5mm long 0.75mm wide, oval, joined at the base variously between 1/3-1/2, brown, pollen egg-yellow. Style - 2.5cm long, white, stigma lobes small, 1mm high, 1mm wide, like erect and spreading, a few papillae, twisted, (type 1 Brown and Gilmartin) light green. Ovary - 5mm high, 2.5mm wide, elliptic, triangular in cross section, light green. Habitat - States of Jalisco and Colima. Mexico. Type - near Tomatlan on road between Puerto Vallarta and Manzanillo. 1 Broader flat leaves not setiform leaves. 2 Inflorescence compound dense spikes which are not turned edgewise to the axis. 5 Sepals longer and free. 6 Petals rose-red 1.5 times longer. 2 Inflorescence longer than leaves. 3 Inflorescence compound of more spikes. 4 Very long primary bracts. 5 Floral bracts glabrous except for tip.